Really depends on your planned usage (e.g., track, weekend fun, daily driver, etc. ), but IMO, make sure it's up to snuff in stock form (i.e., maybe fresh coils and plugs, etc. ), and then start with a software tune of the ECU. If you don't mind exhaust drone, many owners do an exhaust next. After that, the possibilities are pretty much limitless (or limited by how much you want to spend). You'll love it! 996TT Voltage Issues -Help Needed! Thanks for the response. When you say "run a voltage drop test across both primary cables", can you please be more specific (auto electric beginner here)? Do you mean the cable from the alternator to the starter, and the cable from the junction on the transmission up to the power distribution box? If so, I need it spelled out for me. Which terminals on the alternator cable should be used to test the voltage drop (alternator to starter, battery positive in engine compartment to starter, starter to junction on transmission, or alternator to junction on transmission - there's three primary connections on this cable and I want to make sure I use the right ones)? And same question for the other primary cable? And just to confirm, since both the battery and alternator are new within the past 30 days (alt is a Bosch reman), you would still load test both? Thanks. And finally, do you think there is an issue with the voltages I've reported, or is my car "operating as designed"? My car's two year old battery failed about a month ago, and I've been chasing electrical system issues ever since. The 996 Essential Companion book says you should see 13.8V across the battery terminals with the engine running. I was seeing low 13Vs or high 12Vs, so I started the search for the missing volts. Obviously, the battery was replaced with a new AGM battery with the correct Ah rating. Next step was to replace the voltage regulator. No significant increase in system voltage at the battery. So next, I installed a remanufactured Bosch alternator. This seemed to help. Upon start-up, I would see about 13.5V across the battery. But after the engine has run awhile and really heats up, the voltage drops down to about 12.7V (the picture of the voltage reading is at idle after about 45 minutes, engine at idle with the A/C running). So not sure what to do next, I took the car to the dealer for diagnosis. They claim everything is normal (see attached excerpt from service receipt). I've read I should check various connections to look for corrosion. So yesterday, I dropped the rear engine tray and checked the engine ground strap - looks good, and opened up the box where the alternator/starter cable drops down to the connection mounted. Again, no corrosion, but did notice a good kink in the cable (not sure if that matters). The only thing I've read is that sometimes the alternator/starter cable gets over-baked near the starter and that causes voltage issue - supposedly an issue on the 997's; don't know about the 996's. My concern is that I don't think the battery is getting properly charged while the car is running. I've had a Innova voltage gauge in while the car is running, and the voltage is always .6V - 1.0V below what the gauge shows when I use it in my MB SUV. So my question is whether or not my car's running voltage is "operating as designed" as the dealer claims, or whether further voltage tracing is warranted? I'm very curious as to what voltage others are seeing across the battery with the engine running? All help and suggestions appreciated. There have been some part number supersecessions, but all the X50 and GT2 models share the same muffler. It's difficult to find used factory X50/GT2 mufflers, and there are many sellers out there misrepresenting what they are selling. The factory part number on the turbo mufflers (both base model and X50/GT2) is stamped on the bottom side of the muffler case on the passenger side of the muffler. Many sellers mistakenly identify the muffler part number by claiming one of the numbers from one of the heat shields is the muffler part number. This is not the case. The base turbo muffler will always have "027" as the seventh, eighth, and ninth digits of the 11 digit part number (e.g., 996 111 027 75), while the X50/GT2 factory muffler will have "987" instead of "027" as the corresponding digits (e.g., 996 111 987 76). The X50/GT2 muffler has modified internal baffling for better flow to accommodate the higher performance of the X50/GT2 models. I'm assembling my freshly repainted front bumper cover. I ordered the protective films shown in the parts catalog that are associated with the front bumper cover (#18 and #22 in the parts diagram) and easily figured out where #18 goes. I can't figure out where the two #22s go - on the cover itself, or somewhere on the body? I've attached a picture of the actual part and for reference the parts diagram showing it orientation. Any help appreciated! My spark plugs are due for a replacement, so it might seem like a good time to throw in a fresh set of coils in order to avoid potential duplication of labor down the road. My engine presently has no coil-related DTCs, and currently has the "20" version of coils in it. In perusing the Porsche parts catalog, I note the coils for the 955 Turbo Cayennes have been updated twice since my prior coil replacement, and are now number 948 602 104 22, with "21" coils being offered for a period of time. The equivalent Beru (OEM supplier of the Porsche packaged coils) coil part number is ZSE 012, but Beru's part number cross-reference only goes up to the "20" coil, which I already have. That makes me think I would be better served going with the Porsche-boxed coil since it might be an improved version over the "20" version or corresponding Beru ZSE012. So my question is really whether the Porsche part number update really means that the part is updated or not. I've always understood it does, but I'm open to education on this topic since the price for the Porsche coils exceeds the price for the Berus by a not insignificant amount per coil. Anyone know if it's really worth getting the most updated Porsche part number or not? Or if the "if ain't broke, don't fix it" rule also applies for coils. I must say that when I replaced my "09" coils with the "20s", I haven't had a coil related issue since. To close out my experience, I ended up having both fuel pumps replaced and everything is perfect again. I'd say for anyone experiencing a strong fuel smell outside the vehicle near either rear quarter panel, plan on it being fuel pump related. Belatedly, but for the record, I ended up having the PPI performed by Eurosport Automotive in Arvada, CO. 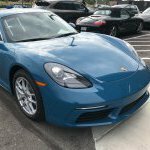 They did a thorough inspection, charged a very reasonable fee, and based on their positive report, I had enough confidence in the car to drive it the 1,400 miles to its new home. An excellent drive with the car performing flawlessly. This is a stupid debate, but having just personally installed an aftermarket exhaust on my X50, factory fitted with X54 tips, I know exactly how the optional stainless steel quad tailpipes are designed since I was just working with them. And one side is not closed off. The tip connects to the muffler as a single pipe, and then splits into the two sides of the tip, both of which flow exhaust gas. So they're differently cosmetically from the base singles tips, but exhaust gas does come out both sides of the X54 tip. They do say the X54 tips are worth an extra 6.3HP . . . just kidding. If I get motivated, I'll post a picture of a real X54 exhaust tip. In the past few weeks I've started noticing a strong smell of gasoline outside of the vehicle near the driver's side rear quarter. I'm not smelling gas in the vehicle . . . yet. I seem to recall reading at some point that the fuel pumps may develop leaks of the top sealing gasket. I know neither of my pumps have ever been replaced during the first 120K miles, so I'm suspecting this may be the culprit, but I am wondering if there is anything else I should check out before taking in it for service. I haven't seen any fuel on the ground or anything, and I don't think I've ever heard of the fuel tank itself developing a leak. Replacing the pump myself is out; it's a job I'd prefer to have an experienced professional do. Most likely a fuel pump? This is incorrect as far as genuine factory tips are concerned. The tubing is split at the rear and exhaust gasses exit through both sides. Aftermarket quad tips may have one side sealed off, but the factory ones don't. A Turbo S will have option code "IE8A" as one of its options listed on the build sheet that is located in the rear luggage compartment under the floor mat. Love, Lust or Run? Looking at a 996TT. That's helpful, thanks. I'm getting a professional PPI performed on it in the next few days and hope it comes back with a reasonably clean bill of health.